We're really happy to give as much information away as we can. Recently people have been asking if they can donate something to say 'Thanks', so you can now do that using the button here - but you don't have to! We're glad we can help! Your donation can be as much as you'd like - just enter the amount after clicking the 'Buy Now' button. There are two ways that we will look at - making at home for home consumption or micro-bottling, and the second is the more industrial scale, but still small-scale bottling. Both methods are a much more manual process than the large bottlers would use, but the bar for entry is much lower. Larger scale bottling starts at around £150,000 - £200,000 and that is still very small in the bottling world. The like of the 'big boys' pump out in excess of 500,000 to a million bottles a day and the equipment costs many £millions. Let's start small. I will assume that you understand that everything that you use must be sanitary and hygienic and how to achieve this. The flavour base or syrup. This can be as simple as lemon juice and sugar (for lemonade) or as complicated as 30+ ingredients in some cola recipes. On a home basis if there is a flavour that you like, but need to extract from something solid (like ginger, chillis, vegetables, herbs etc) then there are a couple of methods. Juice it. For something like ginger the you can grate it then put it in a muslin cloth (cheesecloth) and squeeze the cloth 'til all the fluid comes out. Ginger will be approximately 50% by mass as ginger juice. Other vegetables can be macerated in a juicer (don't do this with citrus fruit - it's unpleasant to say the least), likewise some herbs. Extract it in to another medium. Commonly this could be a sugar solution or water. Industrially ethanol is used. Elderflowers, for example, can be left 'stewing' in a sugar solution until all of the flavour is absorbed by the sugars and the flowers have no scent left. We've found that sugar solution works well to extract most flavours. Alternatively use water, and then concentrate the flavour by boiling off excess water. This is not suitable for volatile flavours that are destroyed by using too much heat. You can extract in to ethanol at home (alcohol is a brilliant solvent) by chopping up your 'extractee' and putting it in a bottle of vodka. This does work but you have to be very careful about dilution of the extract for obvious reasons. You may find that roasting certain vegetables or fruit give a very different, heightened, flavour. Once you have a flavour base then the next trick is to make it taste good as a drink. Too strong isn't good. A wishy washy drink likewise. Acidity. A raw lemon may well make you pull a face like a bulldog sucking a nettle but it's refreshing. This is due to the acidity, and is a key component. If you don't want to add citrus fruit or another strong flavoured acidic base (like Bramley apples), then you may need to think about adding citric acid or malic acid (based on the acids found in citrus fruit and apples receptively). To heat preserve you'll need to have a moderately acidic product anyway (a pH value lower than 4.2), so get used to it. Remember acidity doesn't mean sour - Coke is VERY acidic, but no-one calls it sour! Sugar. Sugar not only is attractive to our tongues but can also be cloying if used too much. It is great to balance out acidity and there are various types. You could use a dark sugar to give a deeper taste, or even a treacle or molasses syrup. One important thing to note is that sugar changes the texture of the product. As it makes it ever so slightly thicker (even a small change in sugar has a large effect here), then it lingers on the tongue longer. The longer it takes to flow over the tongue then the longer the flavours are in contact with your taste buds and therefore the stronger the flavour. If you have a 'watery' tasting drink then try adding a little sugar. Gum Arabic also has the same effect as a thickener if you're happy with using additives. Carbonating. If you're carbonating at home then you'll need to use either a soda-syphon, a soda-stream or buy something similar to a post-mix carbonator. Carbonating a drink at less that 4 degrees C will result in a flatter drink as the Co2 will escape. Remember you must only use stainless steel pumps if you're thinking of getting a carbonating machine to carbonate anything other than water or you will strip the copper from the brass fittings and give people copper poisoning. Carbonated water is acidic in itself (strictly this is now called carbonic acid), and carbonating will therefore result in a slightly more acidic product. If you're buying glass bottles then you will likely find that at the bottom of the bottle are two obvious measurements embossed in the glass. One is the volume (275ml, 330ml etc), and the other is a measurement in mm (millimetres). This second measurement tells you how far from the top of the bottle the correct volume is achieved. E.g. 330ml, 53mm. This tells me that the bottle is filled with precisely 330ml of liquid when the level is 53mm from the top of the bottle. The simplest method of filling at home is to use a simple funnel. The next stage up would be to purchase a gravity filler to fill still products, these run from a couple of hundred pounds for a basic 2-bottle stainless steel filler to many thousands of pounds. If filling a carbonated product the you should use a counter pressure filler to stop 'fobbing', or foaming. More information is available on the useful information page. You can preserve by adding something like a sulphate based preservative (as wine producers do), something like potassium or sodium metabisulphite would do a similar job, or our preferred method which is quick, simple and easily accessible is eat treatment. In essence you can preserve an acidic product by placing the (glass) bottle (cap on) in to a saucepan of water. You'll need an electronic thermometer or temperature probe. £10 from Sainsburys will sort out a simple one for you. Put the bottles in the water and when the water is at 72 degrees C start timing. 20 minutes later you can remove your pasteurised bottles. Try to keep the water from going above 72 or so, and don't let it get below 70. You'll need to put a grill or wire tray on the bottom of the saucepan to stop the bottles being in direct contact with the saucepan as there is a propensity for exploding bottles if they are left on the the bottom of the pan. The water must cover the liquid in the bottles, but it's not necessary to cover the whole bottle. Take all due safety precautions when doing this. For more information on Preservation, including the pH you will need to ensure that the preservation 'sticks'. please see our Useful Information page. 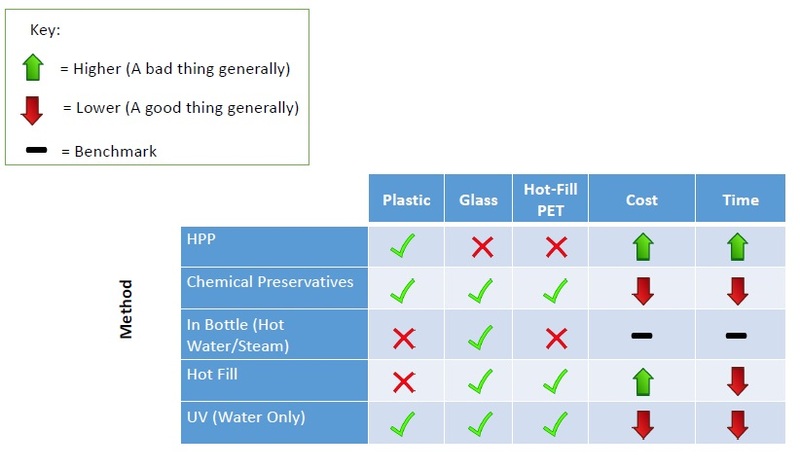 We've made a handy guide to what preservation methods can be used, and which bottle type they can be used with - please click the image to download it - a low res version is below. e can recommend firms for assisting with design work - from posh companies to small, cheaper outfits. If you decide to design your own and print them yourself then remember that an inkjet printer is NOT suitable as the labels will get damp and bleed. Things to consider: Speak to your local trading standards people (or give us a call) to get the legislation regarding labelling. It is vital that you get this right. It's not difficult, but it is important. oxes: Cardboard is actually very expensive. Look to get a standard box as these will be much cheaper. Nevertheless, still expect to pay 50p or so for a standard box. If you're looking to buy a few then eBay is your friend as there are lots of sellers there that make boxes and sell them online. For our customers we've found that for 250-330ml sizes a regular 12" x 9" x 9" box works best. Shipping: If you're thinking of posting your stuff around the country then be aware that couriers are mostly frustrated footballers and will kick your precious cargo, be it fragile labelled or not, at the irst opportunity. And you can't insure glass bottles or liquids in transit. Start locally and deliver it yourself. If you're just starting out, want to see how it's done or any other reason then hopefully we'll be able to help. Most of the people we link to we've done business with and can recommend them. There are some things that you'll absolutely need to know. It can take a huge amount of time to find, and just knowing the right terms to search helps. We've put some stuff together which should help you out. All links open a new window/tab. While we do some NPD and consultancy work here you may decide that you'd be best served by someone who is entirely divorced from the bottling aspect of the work. If so then we heartily recommend Alex Marr. Alex (pronounced "Alec"), has spent a vast chunk of his working life in the industry (and has some global number one sellers to his name), and now consults on all areas of New Product Development from flavour sourcing to bottle design etc. From concept to bottling Alex can help, or for any individual part in between. He's also a thoroughly 'good egg' . Alex can be contacted by requesting his information through our contact page (this is at his request, so he knows where you've found him). Ok, with a rare niche case exception, you'll be having to use glass bottles. This is because they're easily available, relatively cheap, have a quality look and feel and vastly more flexible than specialist plastic bottles. To use plastic bottles like the 'big boys' is a very complicated procedure. On a small scale you'd need to use 'hot fill' plastic bottles which unfortunately are not made or imported officially in to the UK. If you want more details, please ask about them. In general you'll need to buy 'flint' coloured bottles with a 28mm neck in screw-cap or a 26mm neckcrown cap variant. Flint is the colour that the rest of the world knows as see-through. Beer makers use brown and apple juice makers use green. Each has a minimum order of 1 pallet (circa 1,800 330ml bottles), and can supply a large range of different types. Expect delivery to be circa £50 for a single pallet. Of course you can always arrange for your own collection or a courier which may be cheaper. If getting them delivered to your own house or storage you MUST remember to ask them to deliver with a tail lift and a pallet truck or they will expect you to take them off with a forklift which you likely won't have. In general there are two main types of cap - screw cap and crown cap. A screw-cap is our own preferred closure as it allows for sales to stockists who serve the takeaway market - delis, sandwich shops, farm shops etc. A screw cap comes in two forms, an aluminium cap that you'll be familiar with called a ROPP cap (Roll On Pilfer Proof) and a plastic screw cap. ROPP caps are not pre-threaded - they come as a blank aluminium thimble which a machine then rolls on to the threads of the bottle with great force. This machine is expensive and a full-time job for the bench top versions. The pros are that they look great and are consistently tightened with the same force. A pastic screw cap is hand applied and has a pilfer-proof ring too. It doesn't look as nice, you can't get your company name printed on them and they're not particularly cheap. However, if you're a small producer then this is your ONLY option for a screw-cap. A crown cap is applied using a machine that can be bought from any home-brew shop or website and the caps are very inexpensive. However they are really best suited for the 'on trade', i.e. an establishment that will bring you a bottle, open it, and you leave the bottle there. This limits your sales opportunities unless you bottle in to both screw and crown caps whcih could get complicated. We believe in the KISS principle - Keep It Simple, Stupid! for all the MCA plastic screw caps. Buy as little as 1,000 (although their website states otherwise). Also crown caps. If you're looking for smaller amounts then we always stock black, gold and green MCA screw caps. Any homebrew website for crown caps and cappers. We recommend Hops and Vines - they have online ordering and are really lovely. They're a small family business and we support that. Bottling at home is really a very simple thing to do. Up-scaling to a more commercial throughput is a little more expensive, so that's where we aim to help. For still drinks: a simple funnel available from any homewares shop or supermarket. A home-brew place would be a great place to get some inspiration too. For carbonated products - we'll assume you've carbonated the product and now just need to bottle it. For the small scale producer or the large you need a method of stopping the carbonation coming out of the liquid. There are two ways to do this at home: a Bilchmann Beer Gun or a home-made Counter Pressure Filler. You can google the latter for lots of designs - mostly from the States. The Blichmann gun isn't as good at preventing foaming (and therefore losing carbonation) and oxygen pick-up as a counter pressure filler, but it is less fiddly and can be bought off-the-shelf. Both options will be slow and you will definately get 'claw hand' eventually, but that's one of the many compromises you'll have to make. BrewUK supply the Blichmann Beer Gun. There are two ways generally of carbonating at home, plus one cheat. The two proper ways are fermentation (you can ferment without generating alcohol supposedly - a process called partial fermentation, I've never tried it) or force carbonation. The third way is to make your flavour base, or syrup, and add shop bought fizzy water! For force carbonation you have two methods. The simple method is to use a Soda Stream. You don't get to do much at a time, and the gas gets expensive, but it's the easiest method to have a play. The better way to do it, and certainly for making in bulk is to force carbonate in a keg. You'll need to buy something called a 'Cornelius Keg', AKA a Corny Keg. You'll also need a CO2 bottle (food grade only is recommended), a CO2 regulator and some 'disconnects' for the keg. In essence you force CO2 in to the keg, shake the keg (or roll it back and forth) for 10 minutes and then yet let it sit under pressure for a few days. This will force the CO2 in to the liquid giving you a fizzy drink. Corny kegs are available in 5 litre, 10 litre and 19 litre variants. The 5 and 10 litre versions are really hard to find. They can be bought new from Italy for about £120 (19 litre), but we recommend buying second hand. They're stainless steel, and almost impossible to damage. They'll take a pressure up to 100psi. Buying: We recommend eBay for second hand versions. If you want certainty of quality then Brew UK offer Corny Kegs for the £90ish mark. Co2 tanks can be bought or hired from welding supply shops, along with Co2 regulators, although we'd try eBay for the regulators first as they are rather expensive. If you're going to buy a recon Corny Keg, new disconnects and a used regulator you should expect to spend about £100 or so. Buy it all new and it will be more like £250. Top of Corny Keg showing grey Co2 disconnect and black liquid-out disconnect and a 'party' tap. The disconnects allow you to access the product inside the keg. There is no tap on a Corny Keg, you make one by using a disconnect and buying a tap. The Co2 needs a disconnect to be able to pump the Co2 in to the tank. One thing that you absolutely must be aware of is that if you don't preserve your product it will almost certainly naturally ferment. Yeast requires sugar and warmth to correctly start fermenting. Your product will likely not be stored in a fridge when it's bottled, and it will certainly have enough sugar in it to keep the yeast happy. Yeast is naturally found in the environment and can be very dangerous. You may end up with a very fizzy and slightly alcoholic product. More likely you will end up with a bottle shaped grenade that will explode. Unlike a plastic bottle glass does not deform and then fail, it simply explodes in to shards of glass that can penetrate deep in to plasterboard. I cannot emphasize enough how dangerous an unpreserved product can be. There are two main methods of preservation that you'll be able to consider initially - additives or heat. For other preservation methods please see our handy diagram on the How To Make Soft Drinks page. By adding something like Potassium Metabisulphite (among other chemicals) you can kill the yeasts. We don't like adding preservatives, so we use the second method - heating. It is worth noting that heat-preservation only works with an acidic product. Pasteurisation requires heat and acidity to work effectively. Get yourself down to a home-brew store, or from eBay, and buy some litmus test papers. You need to get the pH to be 4.0 or lower - ideally in the pH 3 range. Remember, acidity is measured from 7 to 0. 7 being pH neutraland 1 being extremely (possibly dangerously!) acidic. You need to have the pH in the 2-4 area, not the 4-7 area. There are many on-line resources if you search hard enough, but here's one that helps to explain the pH values. And here's one to help with pasteurisation times. By heating the contents of the bottle to the correct temperature you will denature (or kill) the yeast and any nasties in the product, and all will be well. This can be done in a saucepan, or an electric preserving pan. At a larger scale a pasteuriser to take 120 bottles will cost £5,500 from somewhere like Vigo. Gulp! If you're after a home-scale pasteuriser then Vigo do a couple of models, starting at £170 or so, rising to £200. They will take circa 24 x330ml bottles and will use 1.5kW of electricity. In essence you need to immerse the bottles in water up to the fill line of the product in the bottle, heat the water to 72 degrees then leave in the water for 20 mins. Remove and cool. If you'd like a pasteuriser then we also manufacture them for large scale (200+ bottles) for less than half the price of what you would pay elsewhere, and we can also supply the small preserving pans for much less too. The wonderful world of labelling… what do I need to put on my drinks bottle? The Dec 2014 changes are far simpler. Simply put they require that any of the 14 allergens identified & listed in the EU FIR 1169/2011 document are required to be highlighted in the list of ingredients, and not as previously allowed in a separate allergens advice statement such as “contains milk & nuts”. The one exception to this rule is for alcoholic products where ingredients are not required, in which case a statement such as “contains sulphites” is acceptable. “Fourteen major food allergens must be emphasised in the ingredients list. These are: cereals containing gluten, crustaceans (e.g. prawnsor crab), molluscs (e.g. clams or mussels), eggs, fish, peanuts, nuts, soybeans, milk, celery, mustard, sesame, lupin and sulphur dioxide. Where the allergen is not obvious from the name of the ingredient, there will be a clear reference to the name of the allergen next to the ingredient e.g. ‘casein’ (milk) or ‘tofu’ (soya). Food businesses can choose the method of emphasis that they would like to use, for example, bold, italics, highlighting, contrasting colours, CAPITALISING TEXT and underlining. An allergy advice statement may also be used to direct consumers to the ingredients list for allergen information. There are many standard requirements that any pre-packed food or drink product must adhere to. As always there are exceptions, additional requirements under certain circumstances or ingredients, but to get you started, and for probably 99% of those looking to bottle a drinks product, these should suffice. As always, if in doubt do your own research or speak to an expert. Much of the information found below can be found on various government websites, but we've pulled it all together in one place and tweaked it a little to be more suited to what you really need to know. the name and address of the manufacturer, packer or seller – that’s you. If your food or drink product has 2 or more ingredients (including any additives), you must list them all. Ingredients must be listed in order of weight, with the main ingredient first. You must show an appropriate warning on the label if your food contains certain ingredients. This list is not exhaustive, but contains those which we believe are most suited to the drinks industry. You must follow the European Union (EU) rules for nutrition labelling if you want to show nutrition information on pre-packed products. There are potentially up to 4 or 5 people that would all like to take a slice of the money being made on your product. The main three however are you, a distributor and a retailer or stockist. OK, so lets start from the beginning. First you'll need to work out your COGS, or Cost Of GoodS. hankfully this is quite simple at its most basic. You then need to look at how much a retailer would expect to make as from this you will need to work out an RRP and your sale price to the retailer. Next it can get to be a bit of a vicious circle. You can either work out your RRP based on your retailers expected margin and your own desired sale price, or you can work out your sale price based on RRP and retailer margins. You get the idea. Either way you need to know what they are and how to work them out. An independent retailer would expect to make 40% gross profit, or 40% GP, up to maybe 45-50%. Some stockists would require vastly more, up to 60% GP in some cases! Gross profit can be worked out by taking the RRP, or expected sales price of the product, then deducting VAT (currently at 20%), then taking off 40% from this figure. That 40% is what your stockist would get. VAT will be added to your product at point of sale if your stockist is VAT registered, even if you are not adding it on to your sale price to your stockist. E.g. A retail price of £5.00, minus the VAT = 5/1.2 = £4.17. Then take off 60% (to leave 40%), so 4.17 * 0.4 = £1.66. So £1.66 is your stockists margin at 40% GP. At this point you will see that the RRP is crucial to the retailers margin and hence your buy-price. Hence, as a small producer you must either make your product very cheaply, or sell it at a premium price. Total COGS: £1.27 for a 330ml bottle of lemonade. Ouch. There are some things that you can do to decrease costs as you go along. A 275ml bottle with a crown cap will cost anywhere from 5-10p per bottle less to make than a 330ml. That's just the cap and the bottle costs, not taking in to account the lower ingredient cost in the lower volume. A smaller bottle could mean a smaller label, again lowering costs. We will be saving 6p a bottle on our own branded drinks by moving from a larger label to a 62mm circular label. Pennies add up. However, there comes a trade off, and that is that while some customers will have no problem with crown caps, others will. A sandwich shop for example wouldn't really be able to use them. he short answer here is that there is no 'cheap' way to produce at a commercial scale on a small scale, so you need to increase volume and drive costs down. Don't expect to be made rich overnight, no matter how good the product you make is. Something to bear in mind is that for every 10p you can save the retailer, the RRP can be circa 24p lower and still give the same GP% to the stockist. Working on a 50% GP requirement (purely for the simplicity of the maths): 50%GP is the same as 100% mark-up (GP you work RRP down, mark-up you work wholesale price up), and so 10p saving + 10p retail margin = 20p. 20p + vat @20% = 24p. 24p! A little sometimes does go a long way, and so saving those few pennies might make all the difference. lease contact us for more information, or to get us to help you understand the finances - it can be complicated, and seem pointless, but we're glad we've done it and if we can, anyone can. Please leave a comment if you'd like us to help clarify things further.